Find out what diseases you are genetically susceptible to and take the measures to ensure a healthier future. We test for 35 different diseases. Take control of your health today with our Genetic Predisposition Health Test. This DNA test is a chance to scientifically evaluate your genetic health and your susceptibility to disease. Who’zTheDaddy will analyze your genetic database to establish whether you have any disease-causing genetic variations. So what are your chances of developing prostate cancer or breast cancer? What about Coeliac disease? Are you at a high risk or low risk? With the information from our test results, you can begin working towards creating a life-long, lifestyle programme that will help pave the road towards a longer, healthier life. This is because you have a degree of control over your genetic destiny through the simple choices you make on a day-to-day basis. A DNA sample will enable us to establish those diseases to which you have a high predisposition (or risk) or a low predisposition. 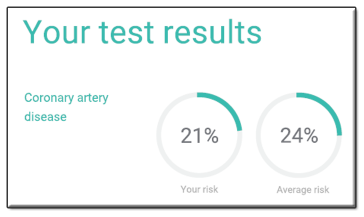 Our results will give an overall, estimated lifetime risk and compare it to the risk factor of the average population (the average life time risk). For each of the 35 diseases, we will also detail the genes that have been analyzed. With every genetic disease tested, different genes will be implicated. For example, our results may show your genetic lifetime risk of lung cancer is 38% whilst that of the general population is 24%. This would suggest that you are at a high risk of lung cancer and thus, ideally you would ditch the cigarettes if you are smoker, avoid long term exposure to pollutants and take other such precautions. We think it is very important to inform clients that although genetic health test results might show a very high predisposition to a disease, it does not in any way mean that they will develop the disease. Conversely, people with a low genetic predisposition may end up developing the disease. This is due to the fact that although lifestyle factors play an important role, there are other factors, both genetic and environmental over which we have no control. To view and check the full list of the 35 different diseases, click here. To view a full sample report, click the below image. To be able to determine which diseases you are at risk to, we need to analyze certain DNA sequences known as single nucleotide polymorphisms or SNPs. Picture your DNA as a very long sequence of 4 letters, repeated in different order. The letters scientists use to denote these sequences are A, T, G and C. An SNP is a variation, a change in the DNA pattern or in the sequence of letters on the DNA molecule. To give an example, AAGCCTA and AAGCTTA are SNPs – we can see that on the latter, a letter C is replaced with a T. These variations will be present in at least 1% of the population in order for them to be referred to as SNPs. Significantly, scientists have discovered that certain SNPs are associated with certain diseases. People might carry a variation on their DNA which is linked to a type of cancer or a cardiovascular condition. For example, the APO gene is a gene we all inherit from our father and our mother; however, it is only the APO4 gene variation that is associated with Alzheimer’s disease and if a DNA test confirms you carry this variation, you will be at a higher risk of developing Alzheimer’s disease. Genetic counselors are trained to make the results of your genetic health test meaningful and useful to you by explaining what the results exactly mean and how they could affect you. Genetic counseling is very distinct to other forms of support, counseling and therapy which fall into the broad field of psychology. Genetic counseling is part of medical health care. Click here to find more information about genetic counseling in the UK. Genetic counselors are an essential part of your personalized health care, giving you guidelines to follow and information about prevention, risk and genetic heritability. If you are thinking of starting a family, genetic counselors can also provide information about the chances of your children inheriting any of the diseases you might be concerned about. We will provide you with an easy to use home sample collection kit. The kit will contain the sterile finger lancet, a medical tool that looks very much like a needle. You will also have alcohol wipes to sanitize the area where the needle will puncture the skin, FTA paper, instructions and consent forms. The lancet will be used to prick the skin in order to collect a small sample of blood. The drops of blood which collect following the pricking of the finger tip using the sterile lancet, need to be collected on a special, absorbent FTA paper. This DNA test is a chance to scientifically evaluate your genetic health and your susceptibility to disease. What is the cost Genetic Predisposition? Who’zTheDaddy offers genetic predisposition testing services at £199. Your results will be ready in 4 weeks with results send by email.